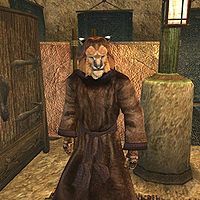 Dro'Zaymar is a Khajiit assassin who resides in Canal South-Three in the St. Delyn Canton of Vivec. He holds the Shoes of Sanguine Leaping, something that has not gone unnoticed by Raig of Vivec's Fighters Guild. Like all Khajiit, he can see well in the dark and can demoralize others for short periods, but otherwise knows no spells. This page was last modified on 2 January 2015, at 22:19.